Does anyone know what this picture is?? 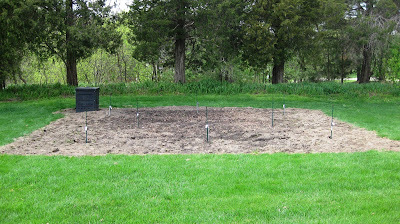 I know it doesn't look like much, but it's my freshly tilled garden waiting for wonderful vegetables to grow. My sweet husband (who is not a gardener), took the rototiller out Monday to work the soil and enlarge the garden a little for me. He also installed a sweet irrigation system that will make it much easier to keep everything watered. If you look carefully, you will see markers where the kids planted our first row of Swiss chard, kale, and beets. I love this time of year, getting everything ready and dreaming of what will grow and having fresh vegetables after a long winter. I thought I would talk a little about fertilizing and soil composition. I know that many are gardening for the first time this year. There seems to be a lot of excitement around growing your own food which is wonderful. I find gardening very relaxing and enjoyable. Where it becomes difficult though is when one goes to the hardware store/nursery to decide which fertilizer/food to feed one's garden. There is this underlying competition in gardening that makes us want to have the biggest/reddest tomatoes, the most beans on one bush, and the giant pumpkin of the patch. Before "going organic" I will admit that I chose fertilizers based on those criteria. Now I realize that even more than feeding the plants in my garden, how I build up the soil of my garden directly affects my own nutrition. For instance, if beans are rich in calcium - which my body needs, but my soil is deficient in calcium I won't get the benefit of eating the beans that I grow. I must supplement my soil with the things that my plants need and that I myself need. Plants, unlike humans are able to use both organic and inorganic sources of minerals. They can draw inorganic/rock minerals into their structure and convert it into organic/living matter that we as humans can digest and use. Inorganic minerals (table salts) do us very little good and can actually build up in our bodies and cause harm. We were created to live in this beautiful symbiosis with plants. They give us organic minerals and oxygen to breathe and we give back carbon dioxide and fertilize them with what they need. The best garden soil contains a mixture of organic (living) matter like compost or manure and inorganic matter like organic mineral fertilizers. You might ask why synthetic fertilizers are bad?? Don't they contain the same minerals that the plants need? Synthetic fertilizers are chemically derived instead of found in nature. Some of these chemicals have been linked to cancers and other health problems. In addition, organic produce is substantially higher in nutrients, which leads to the conclusion that plants don't absorb and assimilate these synthetic chemicals appropriately. Lastly, synthetic fertilizers usually give a plant a quick boost and then are washed from the soil. Organic fertilizers are basically rock which through the aid of microorganisms in the soil slowly release nutrients to plant throughout the growing season. Below is a great chart of some of the most important minerals that our bodies and plants need, what they do, how to supplement your garden organically with them, and which veggies/fruits are especially high in them. Happy Gardening! I would love to hear about and see pictures of your gardens! Vegetables and Fruits: beets, beans, broccoli, cabbage, carrots, cauliflower, corn, greens, onions, and parsnips. Vegetables and Fruits: asparagus, beans, beets, blackberries, cabbage, carrots, cauliflower, celery, corn, cucumbers, kale, lettuce, onions, parsnips, peaches, peas, radishes, red raspberries, rutabaga, strawberries, spinach, tomatoes and watermelon. Fertilizer sources: abundant in sea water and sea vegetables like kelp, bladderwrack, or dulse. Also found in fish emulsion. Vegetables and Fruits: artichokes, asparagus, beans, blueberries, brussel sprouts, carrots, chives, cucumber, garlic, kale, leaf lettuce, onions, potatoes, rutabaga, squash, strawberries, Swiss card, tomato, turnips, and watermelon. Functions in the body: Attracts oxygen in the blood; improves circulation, digestion, elimination, and respiration; and helps prevent colds. Fertilizer sources: greensand, manure and cottonseed meal. Vegetables and Fruits: apricots, beets, blackberries, black cherries, greens, kale, parsley, peaches, peas, pumpkin, radishes, red peppers, spinach, and Swiss chard. Functions in the body: vital to solid teeth and bones; fosters cell growth; calms nerves; necessary for lungs and brain function; promotes sleep; and lowers fevers, cools, and soothes. Vegetables and Fruits: apples, apricots, beans, beets, cabbage, corn, grapes, spinach, onion, parsley, peas, peaches, and pears. Functions in the body: controls nerves, improves memory, increases germ resistance, increases coordination of thought and action. Vegetables and Fruits: apples, apricots, beans, blackberries, blueberries, celery, leaf lettuce, marjoram, mint, parsley, watercress, and wintergreen. Functions in the body: builds tissue, especially muscle tissue; essential for complete metabolism. Functions in the body: stimulates intellect; acts on bone and brain; affects muscle tissue; improves nerve nutrition; necessary for reproduction; and feeds the bones and brain. Fertilizer sources: rock phosphate, bone meal, single super phosphate, and triple super phosphate. Vegetables and Fruits: beans, cabbage, carrots, corn, and pumpkin seeds. Functions in the body: supports muscles; aids in waste reduction; reduces pain; increases blood and tissue alkalinity; supplies healthy hair and nerves; reduces acidity; and prevents ailments. Fertilizer sources: sulfate of potash, sulfate of potash magnesia, muriate of potash, and greensand. Vegetables and Fruits: apples, apricots, beans, beets, black cherries, blueberries, broccoli, brussel sprouts, carrots, cucumbers, grapes, kale, leaf lettuce, lima beans, parsnips, peaches, pears, spinach, Swiss chard, and tomatoes. Functions in the body: contributes to the alkalinity of blood and lymph; essential to the liver, pancreas, and spleen; helps prevent blood clotting; increases osmosis; and counteracts acidity. Fertilizer sources: kelp, manure, bonemeal, and greensand. Vegetables and Fruits: apples, apricots, asparagus, beets, cabbage, carrots, celery, kale, parsley, peas, peppers, spinach, strawberries, Swiss chard, and turnips. Promotes the flow of bile; builds hair, nails and skin; warms skin; beautifies complexion; drives impurities to surface; and stimulates and regulates nerves. Fertilizer sources: garden sulphur, sulfate of potash, and gypsum. Vegetables and Fruits: asparagus, broccoli, brussel sprouts, cabbage, carrots, cauliflower, celery, corn, cucumber, dill, kale, leeks, lettuce, lima beans, marjoram, onions, parsnips, peas, potatoes, radishes, spinach, thyme, tomato, and turnips. Wow! I wish I had a garden! That was so informative... I'm definitely bookmarking this for when I do get a garden. I can honestly say that I have never thought of the soil nutrients this way in relation to the veggies I grow. I will be adding more to my garden area this year! Thanks for the great heads up. Hello Hanlie and Lenna - thanks so much for stopping by and commenting! Good luck with the garden additions Lenna - would love to know how it turns out!